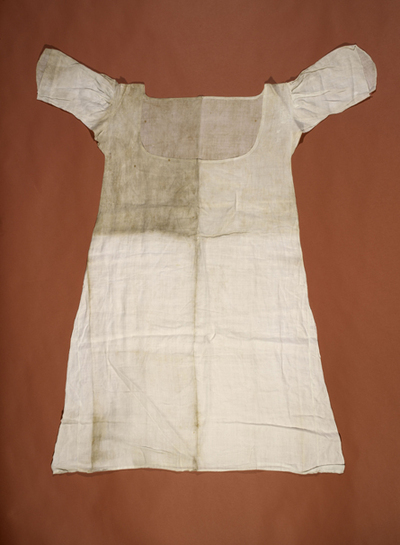 Surviving chemise worn by Marie Antoinette while in prison. I came across this picture and article while surfing the internet today and right away knew I had to post it. To think that Marie Antoinette wore this chemise while in prison is fasinating. To think what all she might of gone through while in prison. The conditions couldnt of been wonderful at all and unfortionatly at the end of it all her life was taken when it didnt need to be. With the onset of the Revolution in 1789, Marie Antoinette again used her fashion sense to represent her. Once the Royal Family was moved to Paris in 1789, Marie Antoinette was no longer able to live a pastoral life at the Petit Trianon. Rather, she began wearing more “Queenly” Robes a la francaise again, covering herself in diamonds to show the stark difference between her royal person and the revolutionary peasants. She staunchly, and not surprisingly, refused to wear anything related to the Revolution, such as the popular tricolore. Once in the Tower, Marie Antoinette’s clothing became very simple and subdued. This was not like her earlier “simplistic” phase with muslin chemise-style dresses. Rather, she wore simple white, brown, or black dresses which reflected her current mood. She also began to loose quite a bit of weight, as shown from a seamstress’s bill for taking in the sides of the Queen’s corsets. Thanks so much for the links! 🙂 I love your site and am adding it to my links sections at Everything Tudor and MA Queen of France!